Tóg sos ón obair, bí ag bogadh! Tá an scoil cláraithe mar bhall den mBrat Gníomhach do scoileanna. Is brat é a thugann aitheantas don aclaíocht agus spórt i scoileanna. Beidh an scoil ag déanamh iarracht ar gcéad brat gníomhach a bhaint amach i mbliana. Tá dhá coiste curtha le chéile chun an obair seo a dhéanamh agus chun comhordnú a dhéanamh ar na gníomhachtaí go léir a bhíonn ar siúl ag an scoil. Coiste múinteoirí agus coiste páistí.Feachtas scoile iomlán atá i gceist agus beidh na páistí go léir gníomhach le linn an scoil bliain.. Is deis iontach é seo aitheantas a thabhairt don sport agus na gniomhaiochtaí sa scoil. 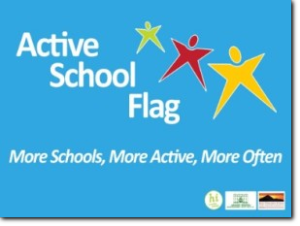 Gaelscoil de híde are currently working hard to achieve their first active flag this year. An active school committee was selected and will have monthly meetings to discuss the schools progress and plan new targets to achieve.